Prestressing increases the load-bearing capacity of reinforced concrete structures significantly and also improves their serviceability. Long span bridges, very slender stressed ribbon or large shell structures as well as tall liquid containers would not be possible without prestressing or at the very least very uneconomical. Aside from the traditional fields of application in bridge and precast construction, prestressing is increasingly being used in buildings and industrial structures. Thus, any structural engineer should possess sufficient know-how in prestressed concrete construction to which this book aims to contribute. This book comprehensively elucidates the design and construction of prestressed concrete structures and illustrates the various prestressing methods and systems. All the necessary background knowledge is provided for the design and construction of safe and durable prestressed concrete structures. 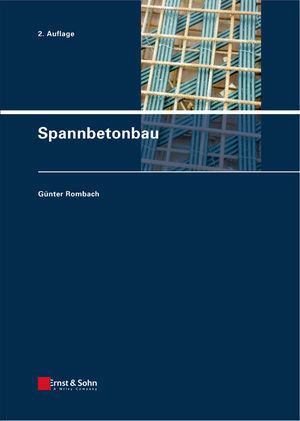 The numerous innovations of the last few years in analysing and detailing prestressed concrete structures as well as in the prestressing systems themselves required an update from the first edition of this book. This edition also incorporates the recent changes in the codes DIN 1045-1 and DIN-Fachbericht 102 as well as suggestions from practical experience. Prof. Dr.-Ing. Günter Rombach is professor for concrete construction at the Technical University of Hamburg-Harburg. Previously, he was active in the construction of mostly concrete bridges and containers for a large German construction company and participated in large-scale projects both in- and outside of Germany. For example, he led the technical office for the construction of a roughly 10 km long elevated road through Bangkok that was erected with externally prestressed precast concrete segments. In 2000 he obtained his license as checking engineer for concrete structures. Prof. Rombach is a member of national and international committees dealing with questions on prestressed concrete construction, the design and erection of concrete bridges as well as the behaviour of bulk materials inside silo cells.